Rating affects your music played in LAUNCHcast and Music Videos. (1/31/01, 5 p.m. ET) - "The Cat" is out of the bag: Peter Criss, a founding member of Kiss, has left the group in advance of its farewell trek to Japan and Australia. The drummer and singer is being replaced for the remaining dates by Eric Singer, who was the last drummer before the 1995 reunion for the band's MTV Unplugged and the 1996 reunion tour. In a statement, the remaining trio said, "Eric has been a member of our family, and his drumming and singing have been the cornerstone of past Kiss tours. We are stoked that we can bring our ultimate spectacle to Kiss fans worldwide." Criss's final Kiss show was October 7 at the North Charleston Coliseum in Charleston, South Carolina. Reports that Singer will have his own makeup and costume could not be confirmed. Kiss will play five shows in Japan beginning March 13, before heading to Australia for seven dates that wrap up at Carrara Stadium on the Gold Coast on April 13. A Kiss spokesperson had no further information, but Criss's departure reportedly stems from a falling out with frontmen Gene Simmons and Paul Stanley over financial issues. Ted Nugent, who opened for Kiss throughout North America on the farewell tour, is not surprised the parties have gone their separate ways. "I saw the offers from Japan, Australia, Europe, South America. We're talking another hundred-million dollars for these guys, but quite honestly, Ace and Peter absolutely refused," Nugent told LAUNCH with a laugh, "which is mind-boggling to me. It's like, where else are they gonna make 200,000 bucks a week--apiece? The answer is nowhere." 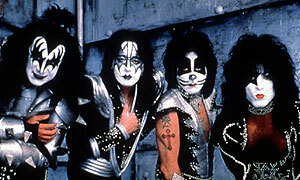 A spokesperson for Ace Frehley denied that the lead guitarist was leaving the group. Got news tips, comments, or questions? Send them to newstips@launch.com. Add Yahoo! Music Music News to My Yahoo! Yahoo! Music Unlimited: Access over 2 million songs - try it free! Add to My Yahoo!/RSS: Get feeds for Yahoo! Music top songs, albums and videos. Yahoo! New Music Alert: Stay current with the newest albums and song releases. Yahoo! Music Backstage: Get the hottest artists, music videos, photos, charts, + more! Copyright � 2007 Yahoo! Inc. All Rights Reserved.